In December 1938, construction plans were announced for a towering library to be built on the Stanford University campus that would hold the library and archives assembled by Herbert Hoover for the study of war and peace. The square top of the tower was to house a large reading room with ample natural light and a spectacular view of the campus and the San Francisco Bay. The architect, Arthur Brown Jr., had designed several buildings on campus, including the main University Library, as well as the ornate and majestic beaux arts city hall in San Francisco (after the 1906 earthquake destroyed the original structure) and the sleekly moderne Coit Tower. Hoover left a great deal unsaid in this brief telegram: for him enormous symbolic significance was attached to crowning his library with a Belgian artifact. Hoover's career as a public servant had begun there in 1914 when he organized the Commission for Relief in Belgium. That unprecedented and controversial humanitarian initiative absorbed his energy and ingenuity for years. He thrived on it. Horrified by what he saw of modern warfare and modern nationalism, Hoover sought the foundations of peace by gathering documentation on the causes of the Great War and placing it in the hands of scholars. For these scholars to work in a library topped by a carillon from the country where the enterprise began would be a fitting expression of Hoover's legacy. The main bell (or bourdon)—a 1,350-pound bronze masterpiece—bears the inscription uno pro pace sono ("I ring only for peace"). Underscoring the symbolism of the bells, the then Belgian ambassador noted that they conveyed the very "spirit of Belgium. . . . The carillon is a form of musical expression which has been interwoven with the life of the Belgian people ever since the Middle Ages. . . . In ancient days, our belfries were established as the symbol and voice of our cities—the outward and visible sign of free government—the symbol of our cherished civic rights and civic liberties." 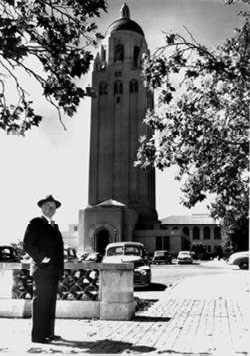 Arthur Brown Jr. immediately began redesigning Hoover Tower to accommodate an 18,000-pound carillon that might be available for installation at the top of the tower. In June 1939 he requested blueprints of the bells, which could not be found, then asked for photographs, drawings, and technical information about the electrical mechanism. According to Brown, "As I believe that Mr. Hoover has his heart set on these bells, from information I have, he will probably get them. 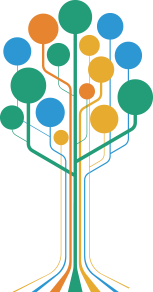 So I want to be prepared to have them satisfactorily installed." Brown had recently installed a much larger carillon in the 400-foot Tower of the Sun, a temporary landmark for the 1939 Golden Gate Exposition on Treasure Island: "We had some trouble with the 'Bourdon' Bell at the Exposition, as it required an opening of over seven feet to permit its installation in the Tower of the Sun. The bells destined for the Hoover Tower, however, I take it are not anywhere near as big." By August 1939, with groundbreaking scheduled that month, Brown wrote urgently to Hoover's representative, Edgar Rickard: "I am anxious to know about the possibility of our getting the bells, and also some idea as to when they might be available, as their installation should be provided for in the building schedule, although as yet we have no provision in the building budget to cover the incidental expense." Construction began with the issue still unsettled. At this time alarming news was coming from Belgium. The fragile peace Hoover had helped broker in 1919 had come apart, and Belgium quickly succumbed when invaded by Nazi Germany in May 1940. Thus the actual deed of sale for the carillon was not signed until October 1, 1940, about halfway through the two-year construction schedule. Financing the project, even for such an experienced fundraiser as Hoover, was not easy in a world shaken by the depression and in the grip of war. Ultimately, the money for the bells was found by Belgian-American Educational Foundation (BAEF) administrators Edgar Rickard and Perrin Galpin. In addition to obtaining the purchase money, Rickard and Galpin supplied the negotiating skills necessary to obtain the bells for Hoover Tower. The final negotiated price came to $16,750, not the $7,500 that Hoover had hoped for. (The BAEF eventually spent more than $24,000 [roughly $285,000 in today's dollars] for purchase, dismantling, transport, installation, and upgrades.) The Belgians needed the money from the sale of the bells to pay the foundry and to demolish their pavilion at the end of the World's Fair in October 1940. The description attached to the bill of sale lists the components: thirty-five bells tuned to play three chromatic octaves omitting the lowest semitones C# and D# and a wooden clavier and bench for playing the carillon by hand. Also included was a large electrically driven drum, which resembles an oversize version of the cylinder of a music box, and works in a way reminiscent of the music rolls in player pianos. The clock-driven device can play four different melodies at the quarter-hour, or 120 full bars of music. Perhaps the true gift from Belgium, however, was Kamiel Lefevere, a Belgian-American carillonneur, who dismantled the carillon in New York, supervised its transport by ship from Brooklyn to San Francisco, and reassembled it in the Hoover Tower. As a child, Lefevere had lived near Saint Rombauts Cathedral in Mechlin. The carillonneur of Saint Rombauts, Jef Denyn, the musician credited with reviving this ancient art, introduced the teenage Lefevere to the technique of manually pounding the wooden batons that rang the bells. John D. Rockefeller had been so impressed by Lefevere's skill that he had entrusted him with the care and playing of the enormous carillon at Riverside Church in New York City. Lefevere contacted Stanford University in August and September 1940, saying he wanted to learn songs that would be familiar to the students at Stanford. According to Lefevere, "a choice of well known American songs and possibly one or two Stanford college songs will make the automatic playing better understood." University president Wilbur suggested "America the Beautiful." Warren D. Allen, university organist, provided such student songs as "Hail, Alma Mater," "Stanford Loyalty Hymn," and "Hail Stanford, Hail." On October 17, 1940, just days after signing the bill of sale, Lefevere and his assistant N. C. Youngster went to the tower of the Belgian Pavilion in Flushing Park. Working well into the night, they removed the pegs from the barrel that had played Belgian folk songs. They cleaned the mechanism and laboriously reset the pegs so that the mechanism would play the Stanford hymns. They then dismantled the bells and crated them up for transport. In December 1940 the bells were ready to ship. 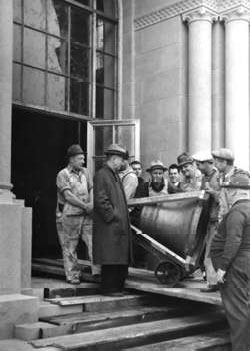 When the bells arrived in the port of San Francisco, Hoover Library director Ralph Lutz then arranged for them to be trucked to Stanford, where they were brought to the fourteenth-floor belfry by elevator. Lefevere and Youngster arrived in March and began wiring the bells. The entire carillon had to be turned 90 degrees to fit in the space and provide proper acoustics. They threaded wires through holes in the concrete floor to connect the clavier keyboard on the thirteenth floor, where the drum of the automatic player was also installed. The weights and driving mechanism were suspended in the corner of an unassigned closet on the twelfth floor. On March 23 Lefevere reported to Galpin: "The introduction of the carillon during the first tryout certainly got a rousing welcome from the student body, who sang and shouted with the music and roared in unison between the numbers 'more, more, more.'" Two evening concerts also attracted a large audience. The bells could be heard plainly three miles away. Drivers in the vicinity began "tooting their automobile horns long and loud between each selection." Lutz later wrote nostalgically of Lefevere to Galpin: "In order to fully appreciate his playing one has to listen to those who have come after him." The tower's dedication formed the central event in the anniversary celebrations. Lefevere, who had been invited back for the festivities, played the carillon before Herbert Hoover's speech dedicating the tower to the pursuit of peace. In six months the United States would be drawn into World War II. The symbolism of the tower and its carillon—to ring only for peace—acquired even greater meaning than Hoover had anticipated. Brown's construction has held up well over the past sixty years. During the 1989 Loma Prieta earthquake that badly damaged many structures on campus, the tower had only minor problems. 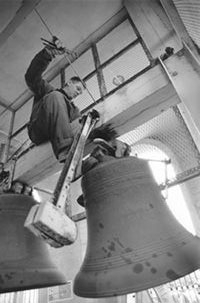 Although the driving mechanism for the automatic carillon player was broken in the 1989 quake, the bells were soon back in working order and were played regularly with the manual clavier. The music has lent a special, festive mood to commencement and graduation exercises for more than six decades. Stanford engineering professor James Angel presided as carillonneur for many years, then trained Tim Zerlang as his successor. Both have pointed out that the bells are not perfectly tuned and that the small number of bells limits the repertoire. In the year 2000, the carillon is finally undergoing the overhaul first recommended by Ralph Lutz in 1943.